This thread is for comments about our Brawler's Guild - Sanoriak guide. Make sure to post if you have some class advice to share! As a Rogue, just use Mind Numbing Poison. His cast time get's so long you can easily Kick Firewall, wait until he's almost finished casting Pyroblast and then Kidney Shot him, and by that time he will be dead. He never got a cast off on me. Very easy fight with MNP. Thank you for this piece of advice! I've just released the guide (added the link in the first post) and I used your advice for the Rogue section. Beat him down and interupt everything you can, talents include stormbolt and disrupting shout. Along with interupt you can keep his casts down quite a bit and when you do have to move throwing charge will stop another cast as well even something not interuptable. Easy fight and a friend watching commented that almost no casts got off. I recommend a build of 211223. Most of the talent options can be interchanged but this is my preferred method and makes good use of the burst that Rets have available. Remember that with a 2 minute enrage timer the T14 4 set bonus will not help, so if you have other pieces that are superior itemization use them instead. The 2 set bonus is still beneficial if you have it. As is the case with most fights in the brawlers guild you will be attacking the boss from the front a majority of the time which means being hit capped and expertise capped (up to the hard cap) is the best way to improve DPS. Keep both Rebuke and Fist of Justice close by to interrupt as necessary. If you do happen to allow Flame Buffet cast to go through or just can't find the hole in the Firewall don't be afraid to Divine Shield out of the situation. The free heal from Glyph of Avenging Wrath is nice but not necessary as there isn't a ton of damage you should take in this fight. I am having trouble getting past this guy on my hunter. Surv spec, ilevel 482. I am getting very close to killing him, but he often pulls away from my pet (using a tanking pet). Even with frost trap, he is able to catch up to me. I die to either the fire wall or his melee. Any specific hunter tips are appreciated! I just did this on my hunter and I was able to successfully kill him on first attempt. I sent the pet in, hit MD then did my usual DPS rotation. Hit Silencing Shot if you see him casting Flamewall and Flamebuffet. Keep out of the way when he focuses on you or any of his spells go through. This is a very simple fight and low-threat for our class as Disrupting Shout and Pummel can be combined with Mass Spell Reflection to hugely cut into the damage he can deal to you. Interruption priority is Fire Wall, with Pummel, and Flame Buffet with Disrupting Shout. 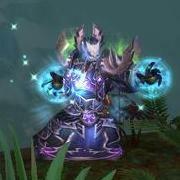 Mass Spell Reflection should be used whenever he reaches about half way through Pyroblast casts, to up your damage output, and if it's not available, stun him with Shockwave (If you have it, it isn't vital but will cause you to take slightly more damage than if you do). Other than this it's a very simple fight and extremely difficult to die on, unless your damage output isn't high enough to kill him before the fire enrage. I'm adding your comment to the guide, thanks! Go blood, spam Death Strike, watch for the fireballs, silence using Mindfreeze, Asphyxiate/Strangulate (if you're a Blood Elf like me you'll also have Arcane Torrent with as well) and constantly use Anti-Magic Shell if you have it glyphed so it gives you that shield. Easy. I did this really easily with as a 488 unholy. Started with army of dead, outbreak, gargoyle and death and decay. Popped anti-magic shell when down to 75% life and interrupted flame buffet. Strangulated him during first fire wall and killed him before he cast the second one. As a 488 unholy DK I struggled. Spawned army of dead at the start. At 50% I use all cool-downs save gargoyle and used remorseless winter followed by asphyxiate. When that wears off I use chains of ice and gargoyle and stay out of melee range. Pretty easy: pop Xuen and dps him. Run out of the wall when cast. As a Mistweaver Monk, pop Dragon to receive heals from spamming lightning. With paralysis to interrupt Fire Buffet, and Life Cocoon to reduce damage, should be an easy fight.